This year I had a little LOT of fun making a new fan video in honor of Richard Armitage’s 43rd birthday. I played around quite a bit and had a blast making it! Hope you enjoy the Richard Armitage Found Footage Fanvideo!!! As a bonus, below is a wallpaper for those of you who are interested in The Crucible. Click for full size (1600 x 900 pixels). The font turned out looking like metal. I just kept pressing buttons in Photoshop and then stopped when it looked cool! This was uploaded on my Tumblr blog where I occasionally post creations. Question: What are you doing this weekend? Any special plans? This entry was posted in richard armitage and tagged 43rd, birthday, fanvideo, richard armitage. Bookmark the permalink. Hilarious! 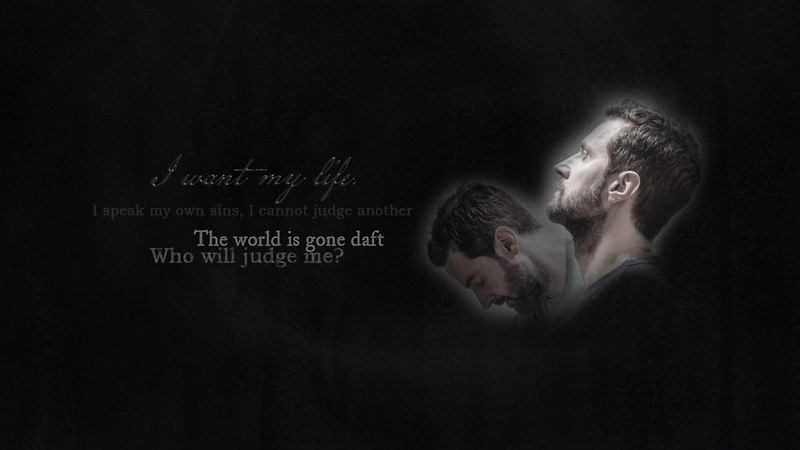 Glad to see you back, and Happy Armitage Day! @Servetus: Aw, thanks! Going to look and see what’s going on around here, LOL! Awesome vid, as always! Glad to see you! @jazzbaby1: Good to see you too! Thanks! @Nat: You’re too kind! I’m glad you enjoyed it! @Helen: How lovely of you to say, thanks! Happy Armitage Day! @april73: Nice to see you and thanks for commenting! @Fanny/iz4blue: Hee hee, couldn’t resist! bccmee’s awesome video for Richard’s birthday! What a terrific gift. 🙂 Happy birthday, Richard!!! It’s great to hear from you again. What a lovely surprise. Is it just me or is he getting better looking each year??? and apologies to Richard but we will always mention the speedos!!! @Anonymous: Oh yes, the man gets better and better looking with each passing year! ❤ LOL re: speedos!! OMG, this is fantastic. I laughed out loud so many times (particularly at the fan scripts), my family was quite irritated. Thanks for this – you are an absolute video wizard… eh… witch… eh… queen. @guylty: Hee hee, glad you liked the Guy bit. 🙂 Thanks for your lovely comment. This video was hilarious! Kudos and thank you for posting. This is some great humor, we have there. How could you not love this man. Hilarious. I loved all the flying around and the Thorin pull toy! Unbelievably creative mind you have (yes, I am almost concerned for your sanity – but no less so for my own). In short — brilliant and unique. Thanks for sharing in the craziness. Love it! Thanks for sharing your talent with us! @Ms Mel: Thank you kindly! @phylly3: So happy to see you again! It’s a fun Armitage Day. Thanks for your comment!! @Peggy Kincaid: I appreciate your kind words. burrito spewed all over ipad screen when Thorin popped up behind Porter. Rad!!!!! @The Queen: Good to see you again! Haha, your comment made me spew too, LOL! Really clever and so funny. Wherever did you “find” it? Thank you for the laughs and snorts. Yes, I admit it, you got snorts out of me. Don’t tell. @Kathy Jones: Haha, I’m a snorter too! Thanks for your funny comment! I love it, B! Once again you have come through with a genius of a video! I laughed all the way through it! I want a talking Thorin! So good to hear from you again! You know it! He could say anything to me! I have seen Into The Storm twice and I really enjoyed it! @Carolyn: Woohoo! I really want to see Into the Storm again. 🙂 That movie needs action figures, on wires, naturally. @zeesmuse: Thanks so very much!!! @Ania: Thanks so very much. I’m delighted to see you too! Fantastic, thank you so much. @MoonRAker: Good to see you again. Thanks for stopping by! So many reasons to be excited today! It’s Richard’s birthday, he joined Twitter (close to 15K followers, notice you are not one, yet) and an RA Birthday video from bccmee. We were speculating yesterday whether we would see one and we have! Great video, so much fun. It is a shame that Richard only has one birthday a year because we would love to see more videos from you. Keep up the good work! Sorry, and what am I doing this weekend? Well I’ve just come from seeing Into the Storm! More than enough excitement for a few days. @Kathie: I want to see Into the Storm again! Congrats on being the first person to answer my question, LOL! @Kathie: This was such a joy to make! Glad I found a little extra time here and there. Thanks so much for your lovely comment. Wonderful BccMee, I like it so much. Excellent work!! You are a genius, so creative!!! @June: Have fun in London! Please don’t get caught in a red telephone box during a tornado, LOL! As usual, you did a great job!! Thanks for sharing!! This weekend… I’m going to São Paulo city to meet my sister and mom… dreaming about having fun there!! @lcardoso70: Your weekend does sound fun! My sister is coming to town and we’re going to enjoy the city and each others’ company. Thanks so much for your lovely comment! Fantastic video, B. So funny! 😀 I love it. Congratulations to yourself and ItsJSforMe, and anyone else you who was involved in the making. @magwi: You’re going to see The Crucible? That’s awesome! It should be a gReAt experience. Now *I’m* dancing with excitement on your behalf and the neighbors downstairs don’t like it, LOL! Enjoy the play! I LOVED this. It was funny! Your vids are always the best. I haven’t had time to go see Into The Storm yet. Went to the UK recently. My youngest daughter goes to a performing arts school and they performed at the Fringe Festival in Edinburgh, Scotland. We spent a few days in London first. I didn’t get the see The Crucible(was at the mercy of the schedule unfortunately). But I did walk past The Old Vic. As I went to take a picture all these doubledecker buses started passing. But I got a good shot. When I tried to take a picture of the poster everybody and their brother starts walking by. But I got a couple pictures of it. None of me next to it.(bummer). I told my husband that was the closest I would ever get to Richard and I was across the street! Watched The Hobbit: Desolation of Smaug on the plane on the way home. @Holliday: Wow that was quite a trip. Sorry to hear you couldn’t see The Crucible though. *hugs* Did you watch The Hobbit: Desolation of Smaug on DVD or was it showing on the plane? 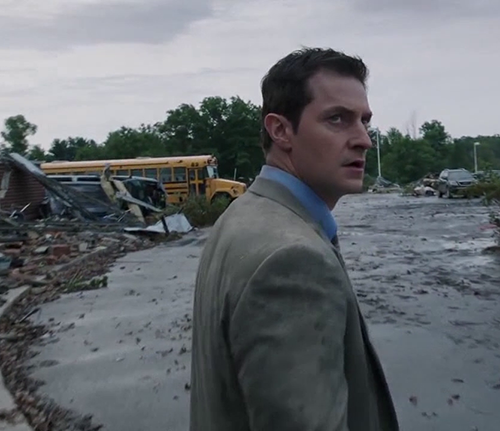 When you go see Into the Storm, maybe you can imagine RA is performing live. 😉 Thanks so much for your comment! I saw it via the plane. I could’ve watched it on the laptop. Hubby downloaded it. But he stowed all the carry on stuff and getting it down would’ve been a pain.I’m embarrassed to admit that I dozed off in the middle of it(in my defense it was a really long flight and I was up really early that day, but I’d already seen it in the theater and had the DVD). I will try to imagine RA performing live when I see Into the Storm. I’m curious to see how he sounds with the American accent. @Holliday: I believe RA did a nice job with his American accent. I was wondering the same thing before attending Into the Storm. Let me know if you agree after seeing it. @Mezz: You would not believe how much fun this was to piece together. Thanks for sharing your hilarious story LOL! Welcome back, B and thanks for the great blog and vid! @jeanniegisborne: It’s good to see you again! Thanks for your words of support. This is the bomb! You even did something with those stupid pieces of colored tape! Nothing is too incidental for a true fan to “repurpose”/comment on! @armitagebesotted: Then I guess I can be classified as a true fan. 🙂 I saw words in the sticky tape in my mind’s eye right away. Thanks for commenting! Hi B – loved the birthday video, always something to look forward to! Cuddly Thorin popping up behind Porter – loved it. Went to see ITS yesterday, with a couple of friends – had to on RA’s birthday – and we really enjoyed it. No particular plans for this weekend – a three day one here in the UK – but in 10 days I’ll be in London to see both RA in Conversation, then The Crucible the following night – can’t wait! @smitkit: I saw Into the Storm for the 2nd time today. I enjoyed it more this time around. How exciting that you’re going to see both the conversation and The Crucible with Richard Armitage! Can’t wait to hear your reports! Thank you for sharing the fantastic video! You are awesome! @grendel’s mum: Thank YOU for posting my video on your Japanese blog! Love this!! 😀 So funny and so, so awesome. To funny, really enjoy your videos! Like that you put Kermit also in the video. I am late because I was not home over the weekend. I was in the Chicagoland area visiting with Mr. 70’s 93 year aunt and her 76 year old brother plus cousins. We had a great time, plus it was was good to get away for a few days before I started back to work on Monday.